This Afternoon (Friday): Clouds building in. Light snow south by evening. Highs near 30. Overnight Friday Night: Pockets of light snow. 1-3” accumulation in Southeastern New England. Lows in the teens. Saturday: Fair with a chilly breeze. Highs in the 30s. Sunday: Sun to clouds, night snow showers. Highs in the 30s. Another light snowfall is headed for New England this evening and tonight and, much like yesterday morning, the snow will be focused especially on Southern and Southeastern New England. This time around, snow arrives during the late day and evening, rather than the morning, moving into Connecticut during the middle to late afternoon, and expanding into Southeastern Massachusetts during the early evening and then moving north into Worcester and Boston by 8 to 9 p.m. The snow won’t fall for long – exiting to the east by about 2 a.m. – but will accumulate one to three inches from southeast Connecticut through Rhode Island into southeast Massachusetts, and a coating near the Massachusetts Turnpike and suburbs north of Boston. The same, broad energetic disturbance will likely trigger at least some snow showers through Northern New England Friday night, too, with the mountains seeing a minor fresh accumulation. 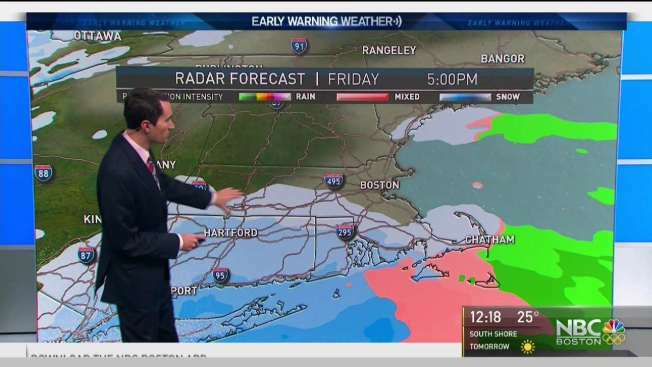 Will Boston Have a White Christmas? Saturday brings sun and puffy clouds with some developing flurries and mountain snow showers, though no major impact with highs in the 30s, and Sunday looks dry ahead of our next disturbance, bringing pockets of light snow or snow showers Sunday night and leaving a few slick spots Monday morning. Overall, our Early Warning Weather exclusive 10-day forecast shows a milder week next week with temperatures rising into the 40s on a couple of days before a stream of tropical moisture aims at New England for the holiday weekend, Friday through Christmas. It’s too early to say whether rain, ice, snow or – more likely – a combination falls on New England next weekend, but we do know it’ll be an active time.